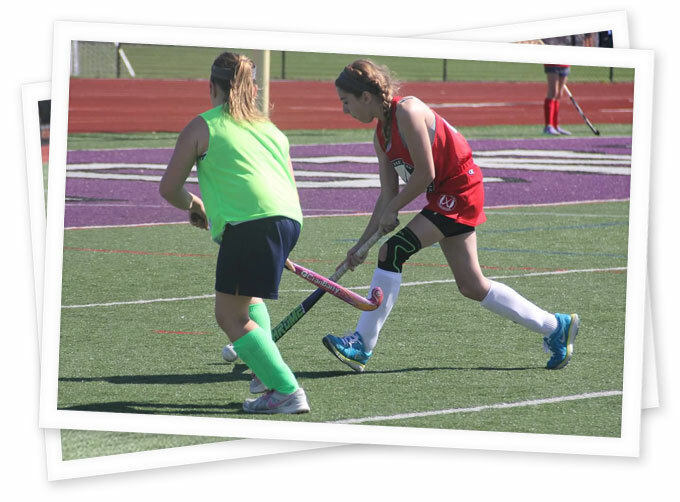 The goal of our Lead the Way Youth and Middle School Field Hockey Programs is to provide consistent training, improve participant’s skills, and provide playing opportunities in Rhode Island and Massachusetts. Programs are offered to athletes ranging from 1st-8th grade. Girls will be placed on teams based on their current grade. Programs will be offered in several locations and players can register based on their regional preference. Players will practice one time per week and participate in League games held on Saturdays. Lead the Way Fall League consists of teams throughout RI, Southern MA and CT.
See down below if you have a team of players that wants to participate in Games Only (no mid-week practices). Girls can sign up for a location of choice and be placed on a team. There were be 1 practice per week (6 in total) and league games. Beginner to experienced players are welcome to sign up. Girls will be provided with a Lead the way Scrimmage vest. Lead The Way also offers an opportunity for existing team to join the Fall League and participate in GAMES ONLY. While players will register through their own local program, they still need to complete our online waiver to be placed on a team. Currently we have teams from Stongington, CT, East Greenwich and South Kingstown and are working with Aquidneck Island to field a team. Find your program below and complete this waiver system AFTER you have registered with your local program. Please use the link below to send an email requesting this option & we will contact you shortly. Be sure to include your name and contact number.